Welcome to Radio Bastet, Rachel Brice's "all-time favorite podcast"! *blush* THANK YOU, RACHEL! Wow. Ahem. Anyway, look out, it's archive show 34 comin' at ya! Get your holiday shimmies on with archive show 32! Featuring a different Omar Khorshid track than the one in the original program, which I had inadvertently repeated from a previous show! D'OH!! Hi gang! Several folks have asked me lately how they can save the podcasts if they don't have an iPod or other portable mp3 player. It's very easy to save them and burn them to a CD. At the top of each podcast post there's a little gray "POD" graphic on the left-hand side. If you right-click on that and choose "Save link as" or "Save target as," you can then download the file onto your hard drive. Beware - the files are HUGE, about 62 MB each! You can then use your favorite audio program to burn the file onto a CD. At the bottom of each playlist there's a "Direct download" link for the podcast; you can use this link as well, and follow the same steps above. And don't forget, you can also stream podcasts from the little player at the top right-hand side of the page, to enhance your web-surfing experience! I hope that helps! Please let me know if I can be of further assistance. And, as always - happy listening and happy dancing! And happy holidays! 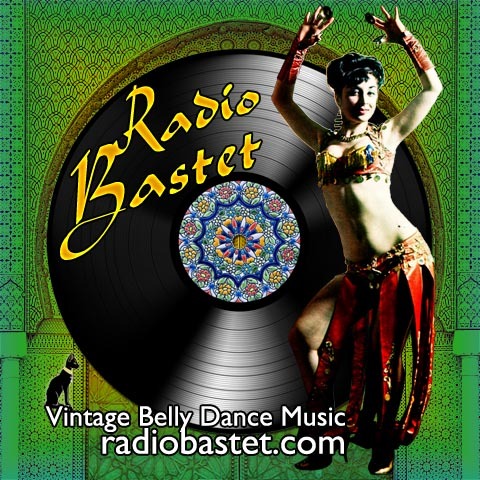 More vintage belly dance goodness with program 31! Work that floor act! And we are back! Program 29 hits the ground running with a selection tailor-made for your flamenco fusion routine! I honestly don't know what to say about archive program 28, except that it is one of my most favorite shows ever. Shimmy on! Yes, you can has archive show 27! Featuring the first appearance of the Radio Bastet "theme song," Ah Ya Zain by Omar Khorshid! The weather is cooling; time for some cool new beats! Here comes archive show #26, featuring George Mgrdichian playing the Beatles! It's archive show 25 coming your way, with a reeeaaally long routine this time... Hope you're in shape! Dive into summer with archive program 23! The water's fine! 4. JOSEPH KARKOUR ET. AL. Program 22 is chock full of vintage belly dance goodness! Shimmy on! Here's archive show #21! Hope you enjoy it! Thanks for bearing with me, folks! Here at last is archive show 20 - more to come! I truly hope you enjoy Program 19; it's one of my favorites! Here's Program 18! Shimmy on! Program 17 features a section of slower tunes instead of the usual routine; enjoy! See that little player in the top right-hand corner of the page? Did you know that if you click on the little Play arrow button in the lower right corner of the player, it will play the most recent podcast? And that if you click the other two buttons on either side, it will navigate forward and back to the other podcasts available? And that if you click on the Arrow tab in the top left corner of the player, the player will detach so you can continue to listen to the podcasts as you surf the web? Did you know that? I didn't know that. How cool is that?? 10. JOSEPH KARKOUR ET. AL. What can I say - another stellar archive show! 9. KEMANI GARIB ET. AL.